Not to be confused with Richard Fischer. Richard W. Fisher (born 1949) is the former President and CEO of the Federal Reserve Bank of Dallas, having assumed that post in April 2005 and retired in 2015. He is now Senior Advisor to Barclays Plc (a British bank holding company) and a Director of PepsiCo. He is Senior Contributing Editor for CNBC. From 2011-17 he served on the Harvard Board of Overseers. A first-generation American, Fisher was born in Los Angeles, California but grew up in Mexico. His father was Australian, while his mother was South African, of Norwegian descent. Following graduation from Admiral Farragut Academy, he attended the United States Naval Academy in Annapolis, Maryland from 1967 to 1969, before transferring to Harvard University, where he earned a bachelor's degree in economics in 1971. From 1972 to 1973, he studied Latin American studies at Oxford University. Completing his education in 1975, he earned an M.B.A. from the Graduate School of Business at Stanford University. Moving to New York City, Fisher joined the Wall Street investment bank Brown Brothers, Harriman and Company, where he was assistant to former Undersecretary of the Treasury Robert V Roosa, specializing in fixed income and foreign exchange markets. From 1978 to 1979, he served as Special Assistant to Secretary W. Michael Blumenthal at the United States Department of the Treasury, where he worked on issues relating to the dollar crisis. Returning to Brown Brothers, he established and managed the bank's Dallas-based Texas operations. Leaving Brown Brothers in 1987, Fisher created Fisher Capital Management, and a separate funds-management firm, Fisher Ewing Partners, managing both firms until 1997. In 1993, he was a candidate in the special election for the U.S. Senate seat in Texas, which was vacated by Lloyd Bentsen when the latter became U.S. Secretary of the Treasury, but took fifth place in a 21 candidate field behind State Treasurer Kay Bailey Hutchison, U.S. Senator Bob Krueger, U.S. Congressman Joe Barton, and U.S. Congressman Jack Fields. The following year, he was a candidate for the same U.S. Senate seat in the regularly scheduled election. Fisher came in second to former Texas Attorney General Jim Mattox in the Democratic Party primary, but won the ensuing run-off election. Fisher lost the general election in a landslide to incumbent Republican Kay Bailey Hutchison as she beat him 61% to 38%. From 1997 to 2001, Fisher served as Deputy U.S. Trade Representative, serving under U.S. Trade Representative Charlene Barshefsky, where he was responsible for the implementation of NAFTA, and negotiating a variety of trade agreements, including the bilateral accords admitting both the People's Republic of China and Taiwan to the World Trade Organization. From 2001 to 2005, he served as Vice Chairman of Kissinger McLarty Associates, a strategic advisory firm headed by former U.S. Secretary of State Henry Kissinger and former White House Chief of Staff Mack McLarty. He left the firm in April, 2005, when he was appointed as President of the Federal Reserve Bank of Dallas, succeeding Robert D. McTeer in that post. He was succeeded as President by Robert Steven Kaplan in 2015. At the Dallas Fed, Fisher was outspoken in 2013 in opposition to the way quantitative easing was being pursued by Fed chair Ben Bernanke and board. As US equity markets began to unravel barely two weeks after Yellen's Dec. 18th rate hike announcement, Fisher came out on CNBC decrying the Federal Open Market Committee's decision to launch QE3 saying that he, "voted against doing QE3" and that QE3 was, "one step too far." Fisher is also a member of Washington D.C. based think tank the Inter-American Dialogue. Fisher is divorced from Nancy Miles Collins, the daughter of former U.S. Congressman James M. Collins. They have four children, including their son, actor Miles Fisher. He married Missy Bailey in July 2017. ^ Richard W. Fisher (April 5, 2006). "A Perspective on Mexico". Federal Reserve Bank of Dallas. Archived from the original on October 21, 2006. ^ Vivien Lou Chen (November 28, 2005). "Fisher, Fed's `Weakest Member,' Speaks Mind, Shaking Markets". Bloomberg Television. ^ "Federal Reserve Press Release". Federal Reserve. December 21, 2004. ^ Reality worse than headlines Kristina Peterson, Michael S. Derby, Eric Morath, and Jon Hilsenrath, "Three Stages of Fed Grief: Key Quotes from 2007," Wall Street Journal, January 18, 2013. ^ Robb, Greg, "Fed's Fisher says QE3 is counterproductive", MarketWatch, February 27, 2013. Retrieved 2013-02-27. 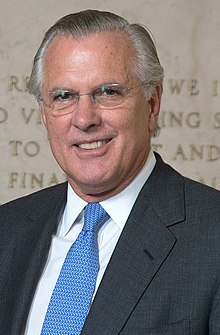 ^ Fisher, Richard, "Fisher's revelatory interview on CNBC "
^ "Inter-American Dialogue | Richard Fisher". www.thedialogue.org. Retrieved 2017-04-12. Federal Reserve and Large Financial Institutions C_SPAN Video Library, June 26, 2013 includes Richard Fisher's testimony about Dodd-Frank regulations regarding "Too Big to Fail" bank bailouts. This page was last edited on 26 December 2018, at 02:30 (UTC).